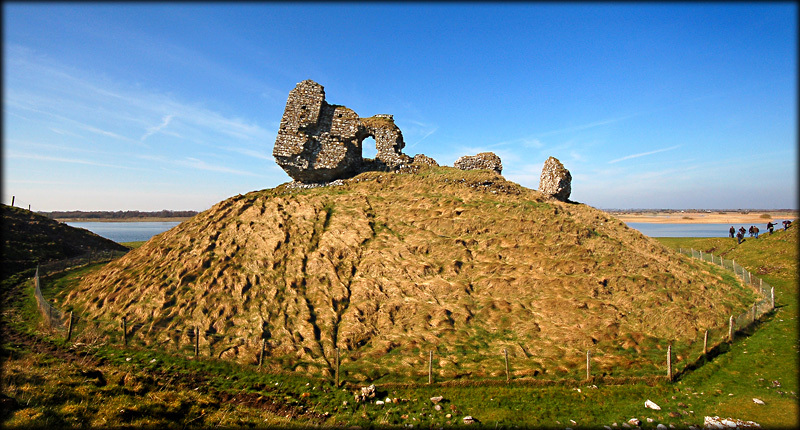 During the period 1170-1220 the Anglo-Normans began the Colonisation of Ireland, building Motte and Bailey Castles throughout Ireland. 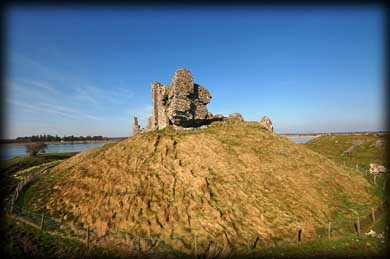 The wooden castle that stood on the top of the motte at Clonmacnoise was destroyed by fire and later in 1214 the Justiciar of Ireland, Henry of London, built a stone castle on the motte. This was to gain control over the midlands and guard the bridge across the River Shannon. 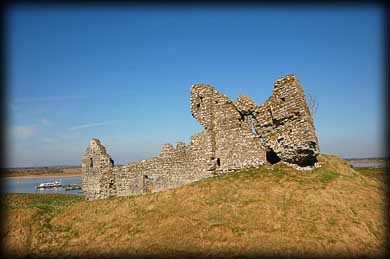 This was a very significant period in history as it marks the time when Clonmacnoise went into decline as a monastic city. The Normans were more familiar with the parochial church and supported the diocesan church. Before the Normans arrived these lands belonged to the Abbot of Clonmacnoise. In 1216 Henry of London was ordered to compensate the Abbot for his lands and any others items like animals or fruit trees the Abbot may have lost. There is a large bank and a very deep fosse surrounding the D-shaped Motte. 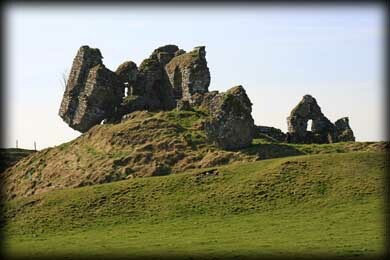 The Castle was destroyed during the Gaelic Resurgence in the late 13th early 14th century. Originally it had three storeys but very little remains of the castle today. The ruins are very dangerous, delicately balanced on the edge of the mound. We have visited the castle twice recently our lastest visit was more fruitful due to the fabulous weather we experienced on this trip. Discovery Map 47: N 007 305. Last visit March 2011.